We are all looking to improve the level of service we provide no matter what department we work in, whether it is in IT, HR or some other multi-letter acronym. The need to improve is driven by high expectations from your customers, internal or external. From your businesses perspective they are calling into IT support, for example, and have no concern of what the title of the support team is just as long as they can get help as quickly as possible. Depending on your IT organization the evolution of moving from the term ‘help desk’ to the ‘service desk’ may fundamentally mean nothing at all with the exception of the title. In essence the background to the difference between the two was broken down to what they were meant to accomplish. A help desk, for example is more focused on the person calling into support. They are looking to address fixing issues that are happening right now. For example, I can’t seem to access a particular group folder. The help desk would help this person out by correcting or providing a way to minimize impact through a workaround. The service desk on the other hand takes this to the next level and looks to leveraging other teams to correct this issue for the larger business community which makes it far more strategic. So, is there a next natural progression from the service desk? 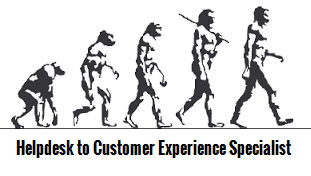 Is this where the customer experience specialist or team comes into view? Don’t forget that the customers will still not know the difference on what type of entity they are speaking with. While the intent may be the same, the outcomes are what will be important from a customer’s perspective. The next question you need to address is at what point does this team then become accountable for all customer experience activity not only with IT issues but HR ones. If this team has the skillset to address customer concerns and is well complimented with support counterparts which have specialties in HR or databases or facilities, how does this impact your organizational dynamics for supporting your shared services within an organization. Your support would then truly become a one stop shop rather than function centric service desks. Taking the service desk to another level within your organization is not going to be simple. You will need to continually look at where you are from a service delivery standpoint and determine what level of capability is best for your customers, the help desk, the service desk or something new. As always I welcome your feedback.